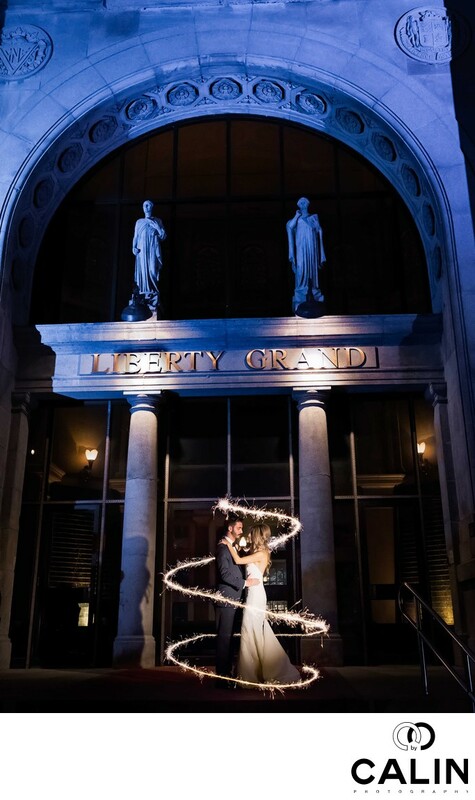 Liberty Grand is one of the top wedding venues in the GTA. 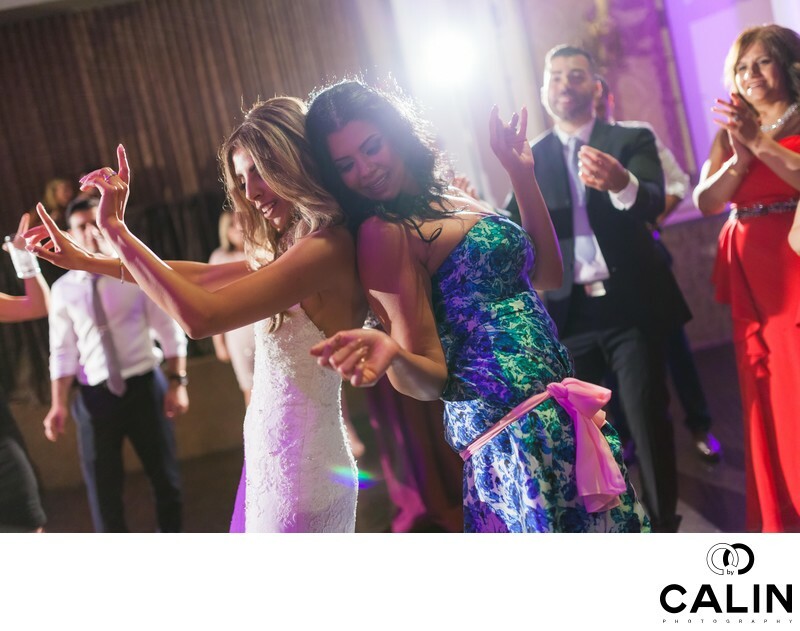 Its classic elegance, reasonable cost per person, excellent services, great food and location make this one of the most sought-after event spaces in Toronto. 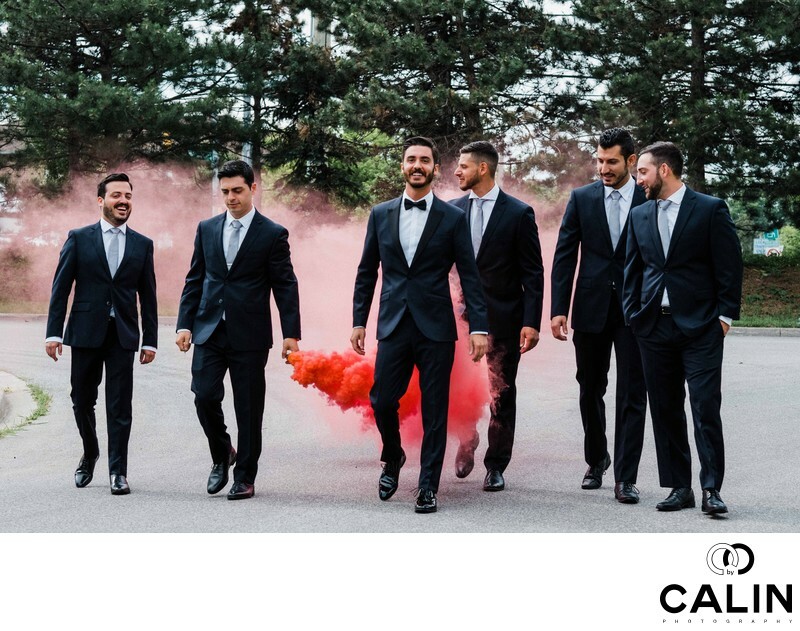 If you are looking for a wedding photographer, please note that we charge $2500 for 10-12 hours of photography including an optional engagement session. 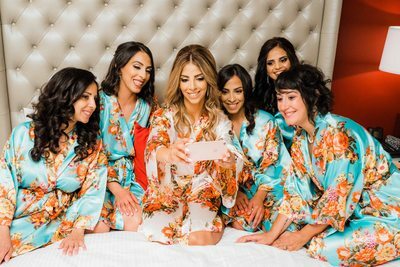 For a full wedding album, please scroll down to the end of the article. 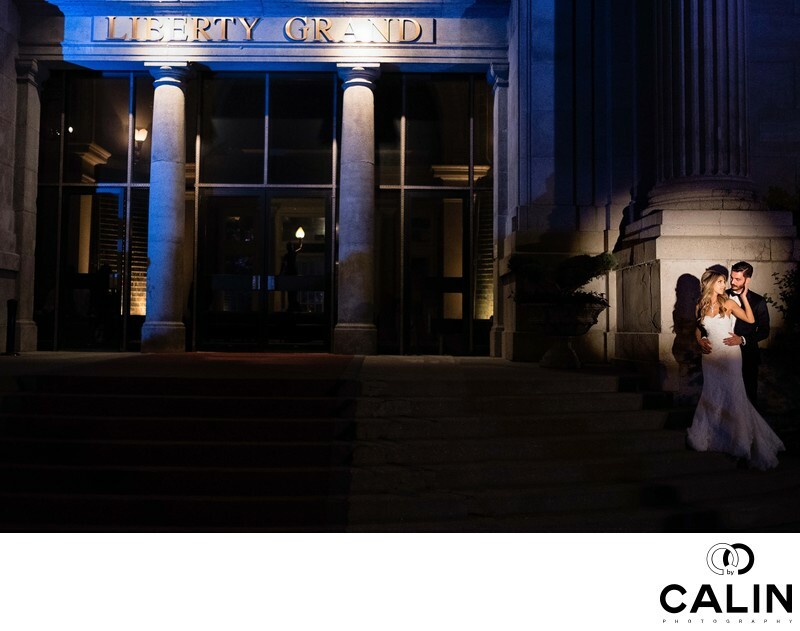 According to Liberty Grand, the wedding associated cost is between $110 and $140 per person and includes an open bar and the rental of the venue. Offseason weddings between January and March receive a 10% discount. Also, Friday and Sunday weddings receive the same special pricing. I need to mention the establishment offers probably the best value you will get in the GTA and that is the reason Liberty Grand is in very high demand. 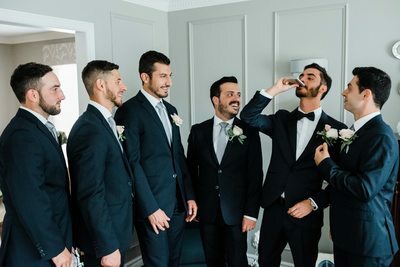 The packages include rental of the hall, sound equipment (most places charge extra for this), servers, bartenders, standard 8 hours bar, wedding coordinator, bridal suite, tasting for the couple and some other extras. There is very little else for which you pay extra (dress, officiant, photographer, etc. ), and that gives couples peace of mind. 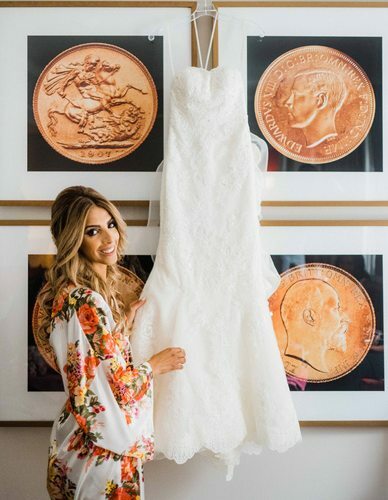 According to our study the place is among the top 50 most desirable wedding venues in the GTA. The establishment does over 200 marriages a year and as you can imagine, the staff is expert in making your special day... really special. 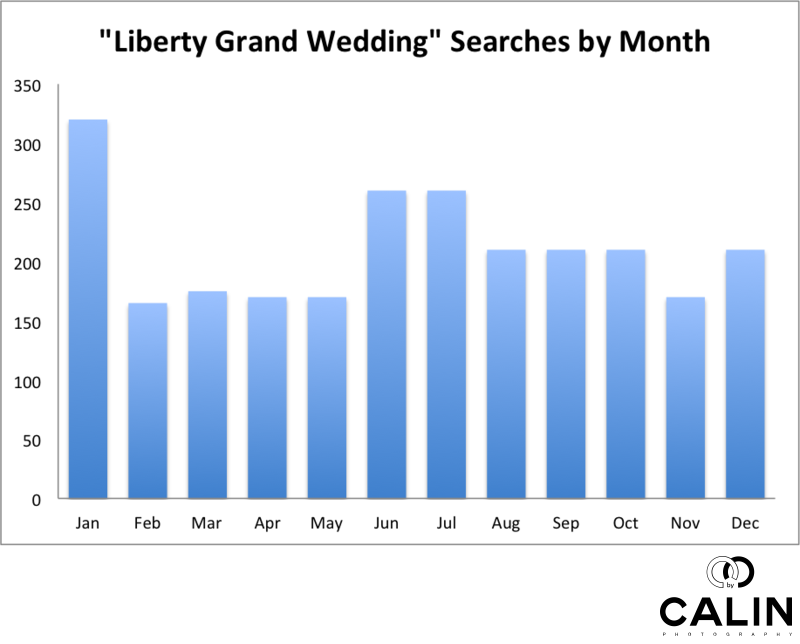 As you can see in the chart above, on average 210 couples are interested in getting married at Liberty Grand on a monthly basis, with January being the month with the highest number of searches. 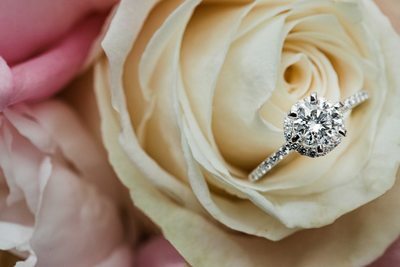 As most engagements happen during the winter holidays, most couples look for a wedding venue in January. If you are getting married here, you don't need a photography permit. 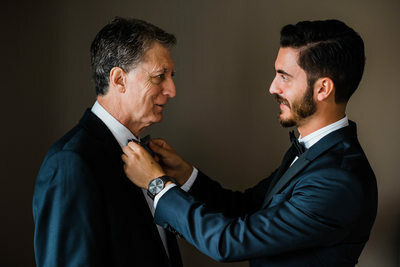 Still, given that the establishment often hosts two or even three marriages at the same time, please check with your wedding coordinator how much time you have available for photography. If the weather is cooperating, you might want to have an outdoor ceremony in the triangular courtyard. I documented events in the courtyard from April to October and when it is a bit cold you have the option of having tall gas heaters brought to keep your guests warm. The long aisle will allow us to take plenty of images during the processional and recessional. Capable of hosting 200-400 people, the photogenic courtyard boasts a fountain, statues, greenery and provides an oasis of tranquillity right in the heart of the city. That makes it a perfect setting for wedding ceremonies. If you are getting married in the winter, any of the banquet halls can host your indoor wedding ceremony. 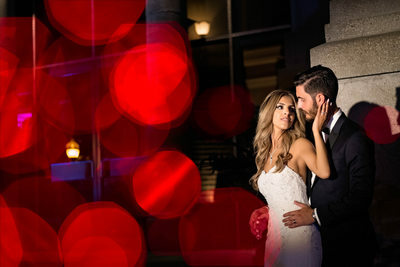 Located minutes from downtown core alongside Lake Shore Boulevard, Liberty Grand or CNE Ontario Building is a fantastic location for wedding photography. The courtyard offers a photographer perfect backdrops. Because it is surrounded by relatively tall buildings, many parts of the courtyard receive an even diffused light, which is ideal for photography. Even more, the darker walls create splendid backdrops and make you stand out in your white wedding dress. Please note that in the summer it is common to have two or three weddings the same day. As such, if you want to take pictures in the courtyard, please discuss the possibility with your coordinator and plan accordingly. 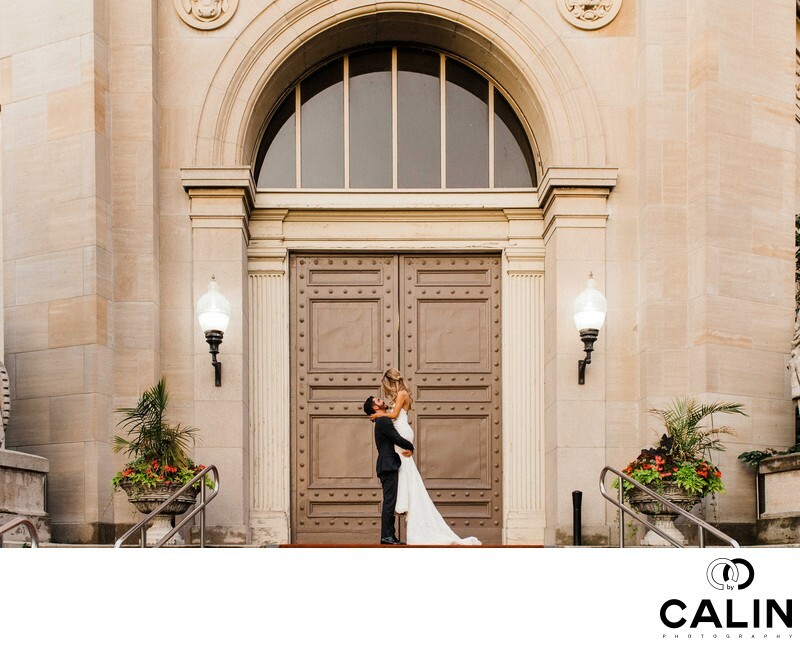 The massive entrance doors are perfect for romantic sunset photographs such as the one below captured in front of the Renaissance Hall entrance. Facing west, this spot is ideal for golden hour pictures of the couple. The best part? You will not spend more than 5 minutes taking photos before sunset. 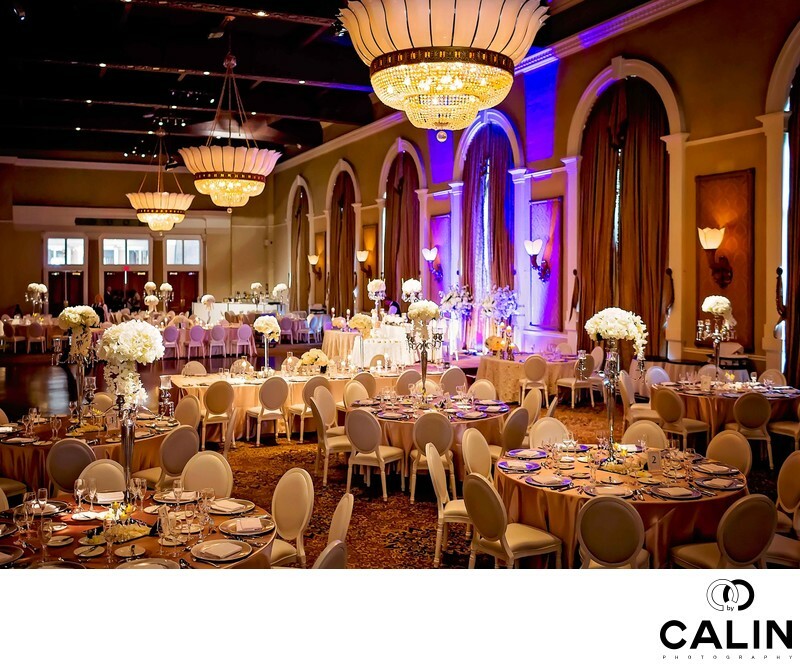 All three halls exhibit a classic elegance and feature massive crystal chandeliers, which look amazing in wedding photos. The massive windows provide the ideal light or backdrop for your bridal portraits. At night, the whole building and the courtyard are lit with beautiful uplighting and become a luxurious backdrop for your wedding images. Here is where we can create splendid environmental portraits of you and your husband. Given its proximity to Lake Ontario, we can go take a few shots by the lake to give you a more variety of photos. 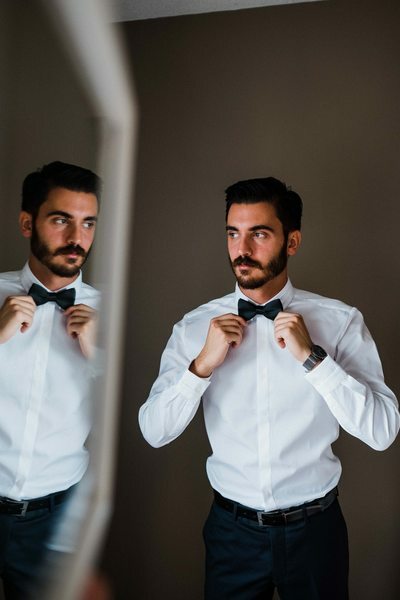 Also, you might want to have a first look either in the courtyard or somewhere in downtown if you chose to get ready at one of the hotels in the financial district. Quite a few couples want to do a photo shoot in the Distillery District or the University of Toronto. If that is the case, please allow extra travel time as downtown and the Gardiner Highway could be busy on the weekends. 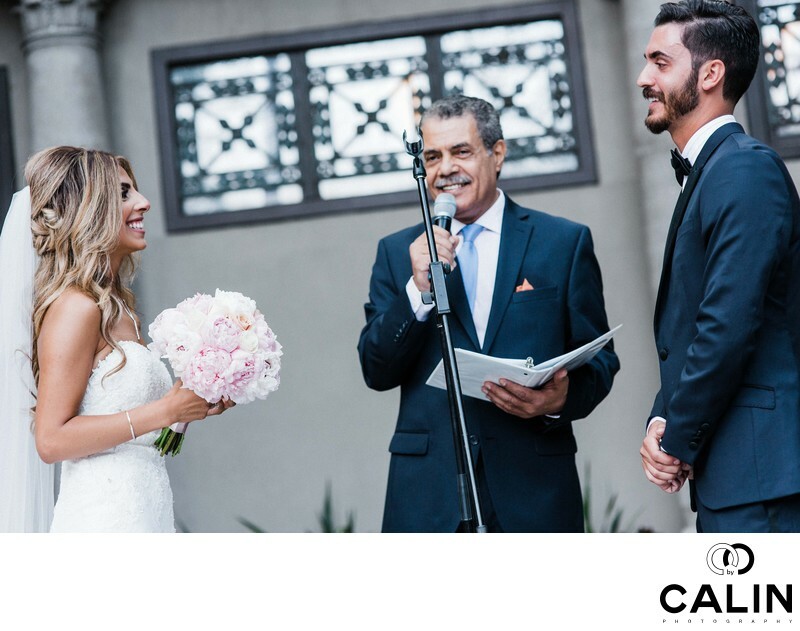 In the past I noticed multiple marriages occurring at the same time so please make backup plans for your wedding portraits session and family photos, especially if you intend to use the common areas such as the courtyard. If the weather cooperates, the courtyard is your first choice when it comes to group photographs. Even if it is a bit cold, you can have tall gas heaters brought in so that your guests keep warm. The three halls have air-conditioned foyers where we can take group photos and your family and guests could enjoy the delicious hors-d'oeuvres and a drink during the cocktail hour. 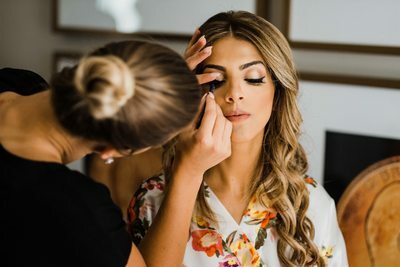 If you are getting ready in one of the hotels in downtown (King Edward Hotel or One King West Hotel), you could have a first look by St. James Cathedral and a short photo shoot in St. James Park. U of T, Distillery District and Lake Ontario are also good choices for a first look and High Park is 3 km from the establishment. The interior courtyard is also a perfect location for a private first look and a photo shoot. Because the complex is situated in near downtown, you can choose a multitude of places to have your first look. The complex is one of the busiest in town hosting about 220 weddings a year! The four breathtaking banquet halls are in such high demand that you want to book hall at least 12 months in advance. Please note that a minimum 150 guests is required. Receptions are hosted in the Governor's, Artifacts, Renaissance or Centennial Room. While the very high ceilings create a challenge for many photographers, the establishment has beautiful spotlights illuminating the head-table the cake and the dance floor for the first dance and parent dances. This is the largest banquet hall in the 100,000 square feet complex. The grand ballroom can accommodate between 300 and 800 guests in a sit-down dinner setup or up to 1500 people if you are having a cocktail party. The hall boasts 27' ceilings adorned with splendid chandeliers that will give the place a romantic atmosphere during the dinner. A massive oak staircase overlooking the courtyard and the dining area is a great spot to take photographs of the whole hall or a large group photo of all your friends, family and guests. The luxurious banquet halls (~14,000 sq. ft) boast splendid views of Lake Ontario through its floor to ceiling arched windows and are mirror images of each other. Both halls have their own private foyer that can host your cocktail hour. Also, you have access to the southern Dome surrounded by four interior waterfalls where you can take group photographs. The Renaissance and Centennial rooms can accommodate up to 400 people for a sit-down dinner setting. If you book the Governor's, Centennial or Renaissance halls, I recommend purchasing a package that includes uplighting as it emphasizes the splendid Beaux Art architecture and your photos will look great. The Artifacts hall boasts 20,000 square feet of minimalist, open space, contemporary space and often hosts fashion shows, TIFF opening nights, fundraisings and more. It can accommodate up to 1200 guests should you have a reception style wedding and about 200-600 in a banquet style setup. 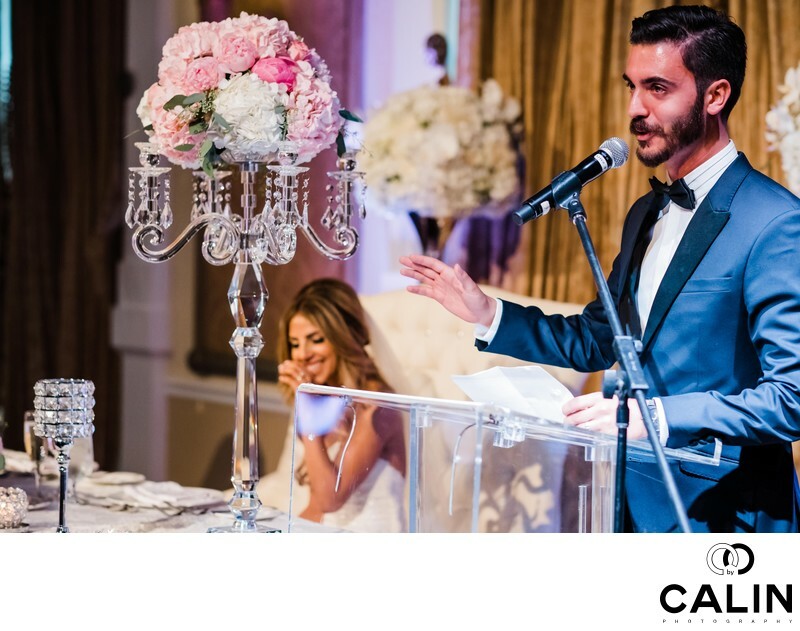 The Artifacts hall boasts state of the art sound and lighting systems and is perfect for a non-traditional wedding in a space with a modern flair. All the furniture and fixtures can be moved so you can design your floor plan with no restrictions. The uplighting and polished concrete floor gives the space a modern look. The space has a private terrace and a lobby that it shares with the grand ballroom. The food is delicious and you can select among seven packages that include an 8 hour standard bar (you can upgrade to a premium bar). Please note that the establishment is allowed to serve alcohol between 11:00 am and 1:00 am. The two Executive Chefs, Michael Ewing and Daniel Pointe have an impressive resume and "bring to the table" over 50 years in the industry at some of the most prestigious restaurants and hotels in town. You have plenty of options including Mediterranean or vegan and the chefs can even design ethnic menus. Here is a complete list of wedding packages. Please keep in mind that the menu can be changed and you can substitute dishes for similar value alternatives. The children's menu is $27 per person. There are four complimentary bridal suites upstairs and you are welcomed with a bottle of sparkling wine and chocolate dipped strawberries. There are 1500 parking spots available on the north and east grounds and you could book parking through the establishment at a discounted rate. A staff member will direct your guests to the parking lot. If you desire valet parking, please discuss that with your coordinator and they will be happy to oblige. There is a parking lot for persons with disabilities on Yukon Place, at the southern entrance. Your guests can also use it for drop off and pickup. There is always a security team on premises and they deal with potential wedding crashers. Also, the main entrances are self locking though one can enjoy a cigar and a drink in the courtyard. Delicious food. You can schedule your tasting about 2-4 months before your marriage so your guests have plenty of time to decide what they desire to eat on your wedding day. The establishment hosts over 200 weddings a year and have a lot of experience. Depending on your guests budgets, you can find plenty of good hotels in the area. For example,Gladstone Hotel (4.3* out of 5* on Google) is only 1.4 km away. Also, Hilton Garden Inn is 4 km from the venue. For more discerning guests, King Edward (4.5* on Google and 6.7 km away) or One King West Hotels (4.3* and 5.5km away) would be a great choice. Because of its size, the complex offers plenty of opportunities for photography. Still, for outdoor photography, I recommend avoiding the period between 10 am and 2 pm. 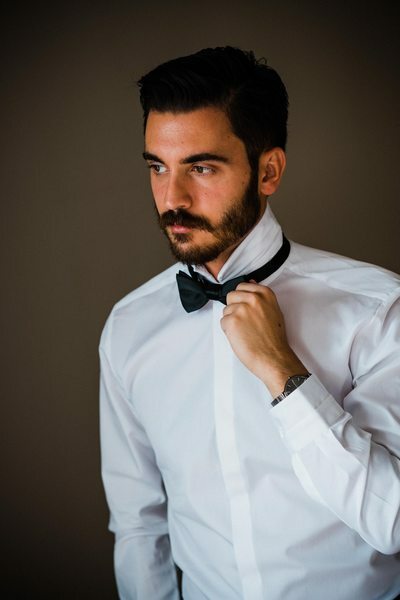 According to www.golden-hour.com. here are the time slots that offer perfect lighting by month. If all halls are booked, the only places that come close to the grandeur of Liberty Grand are Casa Loma (at a higher price tag), King Edward and One King West. The triangular magnificent heritage Beaux Art building opened in 1926 and maintains its original character. In 2001 the building was completely renovated. If you dream of getting married in a historic building in downtown, this could be your location. Originally opened as an exhibit site for the Government of Ontario during the Canadian National Exhibition. In 2001, the Liberty Grand Entertainment group won right to lease the building for 20 years to use it for weddings and private events. 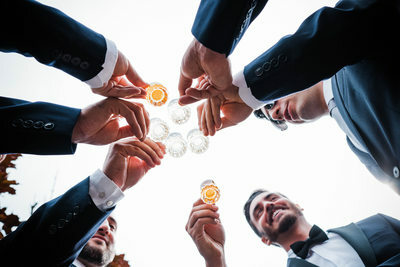 The group already hosted about 4,000 weddings and the service quality here is always exceptional. 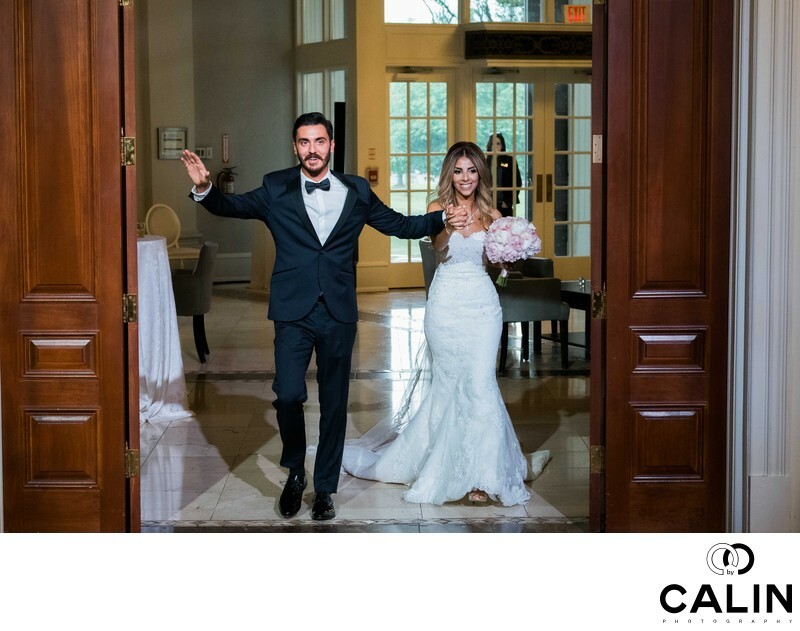 The complex is on the shore of Lake Ontario, which provides nice areas for wedding photography and where we can take your photographs there if you want. Among the movies filmed at the Liberty Grand also known as CNE Ontario Government Building are The Perfect Man, Three to Tango, The Strain, How to Lose a Guy in Ten Days and more. When you draft your timeline, consult your coordinator. These professionals have a vast experience and I have rarely seen such dedicated wedding planners. Again, I have no affiliation with them, but they bent over backwards to create all the conditions to make my couples happy. Here is a slideshow with highlights of the big day.